The Ka Shad Suk Mynsiem Festival is also known as 'Dance of the Happy Hearts' or Shad Weiking. It is celebrated at Weiking Ground in Shillong and attracts a large population from all over the state. 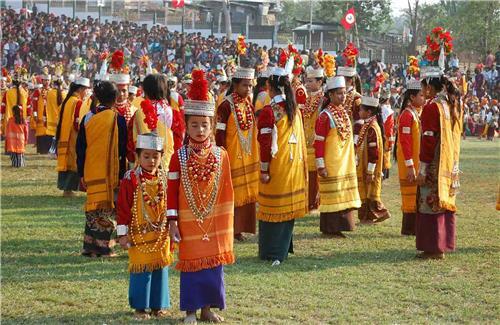 The three-day festival comprises of the traditional dance of the Khasi tribe in which unmarried maidens and men dance and salute the Almighty and also pay homage to the ancestors while proclaiming unity of the Khasis. Ka Shad Suk Mynsiem Festival was earlier known as 'Shad Phur'. The entire community is very enthusiastic about the festival. The festival was organized for the first time at Weiking Grounds way back on 14th April, 1911. Later, it was also held at Mawkhar for a few years. The Ka Shad Suk Mynsiem dance is an integral part of Khasi heritage and is performed on the beats of drums, cymbals and piping sound of Tangmuri. Music and dance are integral to every celebration and festival of the Khasis. The Ka Shad Suk Mynsiem dance requires skilful rendering. You must be knowing about 'phawar' - a song comprising of chants, ballads and verses which contain stories about martyrs and other legendary heroes among Khasis. The dance is supported by varied musical instruments. These instruments provide beats for the dance and also aid in 'summoning' and inviting people to the event. Traditional instruments comprise of 'tangmuri', besli (flute), nakra (big drum), Ksing padiah (small drum), sharati, shyngwiang, duitara (stringed instrument) etc. Today, even the modern Spanish guitar is used as an accompaniment for entertainment! The Ka Shad Suk Mynsiem dance festival is celebrated in the month of April in Shillong and other parts of Meghalaya state. It is an annual spring dance festival performed to celebrate harvesting and sowing. The participants are unmarried (virgin) females and married/unmarried males. The dance is a ritual and symbolizes fertility also --- the women are receptacles of seeds and bearers of fruit while the men are the cultivators which protect and nurture the seeds till the crop is harvested. Female dancers wear cloth draped from waist to ankle known as Ka Jingpim Shad. They wear full sleeve blouse with lace work all around the neck, necklace made of red coral and beads, golden ear-rings (Ki Sohshkor Ksier) with their braid adorned with fresh flowers (Kapangsngiet Ksiar Ne Rupa). They also wear silver armlets (Ki Mahu), golden bracelets (Kikhadu Ne Ki Syngkha) and silver chain around the neck (U Kynjiri Tabah) and carry a handkerchief too. The male dancers wear a golden silk turban (Ka Jain spong Khor), a silver chain across the shoulders (U Taban), silver quiver and arrows tied to the waist, a dangling animal tail, maroon silk cloth worn like a dhoti (Ka Jainboh) and carry a ceremonial sword (Ka Waitlam) along with a handkerchief (Ka Rumar). The male and female dancers dance in two separate circles with women in the inner circle. They keep their eyes downcast and dance with minimum body movements. However, men move swiftly and energetically with galloping movements, sometimes slowing down and sometimes speeding up at the beat of the drums. They move clockwise and anti-clockwise moving in circles throughout which symbolizes protection of women. Towards the end, the dancers start moving faster. Female child dancers leave so that the inner circle becomes smaller. The men engage in mock duels and sword fights. As the sunset draws near, the dance too comes to a halt. 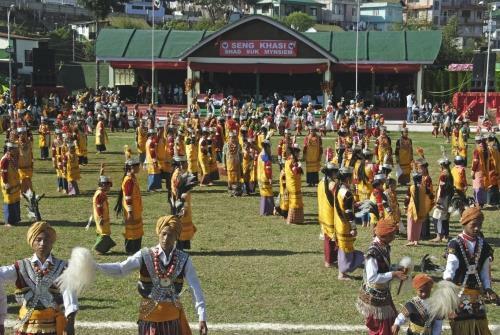 The dance festival at Weiking Ground in Shillong is state recognized and is one of the most important festivals organized by Seng Khasi.